Listen to and watch our most popular English learning podcasts and videos in LearnEnglish Audio & Video! 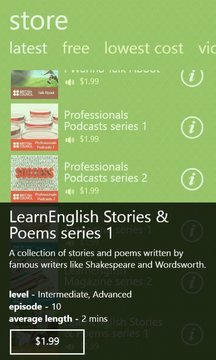 The app is packed with lots of cool features like, an audioscript, glossary and videos in landscape mode. Improve your listening and learn new vocabulary on your mobile device, anytime, anywhere! With LearnEnglish Audio & Video, you can access the best podcasts and video brought to you by our LearnEnglish website, as well as lots of special features. The podcasts and videos don't require internet streaming, so you can access the content even when you're away from your computer! If you like our app, don’t forget to rate it in the app store. Thanks, and happy listening and watching!